교토, 일본의 제이-하퍼스 교토 게스트 하우스 | 호스텔월드에서 예약하세요. If you wish to cancel or change your reservation, we will require advance notice 5 days before the date of your arrival, otherwise, you will be charged the half of the amount due on arrival as the cancellation fee. Cancellations made with 5 days notice or more will not be charged. NOTE - If you fail to check in as scheduled, we will cancel all your bookings and you will be charged the half of the amount due on arrival. During your stay, we also require advance notice 5 days before the date when you want to cancel the booking on. As long as you notify us 5 days before, we will refund the fee you have already paid. Please notice that the hostel is a five-storied building, and there is NO LIFT. 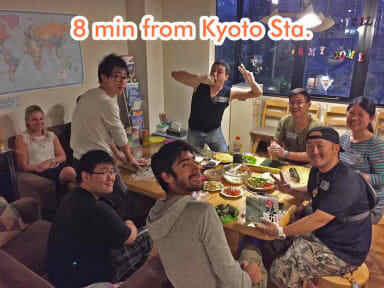 Hostelworld guests have said they appreciate that J-Hoppers Kyoto Guest House is 'just a 5 minute walk away from the Kyoto Station where people can easily connect to major Kyoto attractions and trains to other cities'. 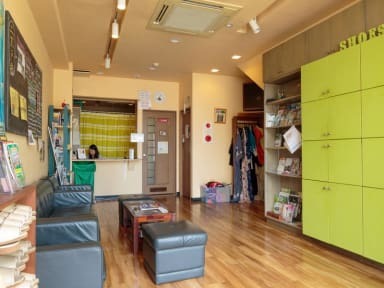 This friendly, clean hostel features free parking for motorcycles and bikes, free Wi-Fi throughout as well as free games and kimono dress-up. Each of the large beds in the comfortable dorms includes privacy curtains, personal reading lights, shelves and room for luggage. 버스 정류장에서 기요미즈 탬플, 기온, 도심지역, 니조 궁까지 도보 1분. 여러분의 편안한 관광을 위해서 원데이패스를 리셉션에서 구매하실 수 있습니다. 모든 직원들이 높은 수준의 서비스를 제공하니 집같은 마음으로 지내세요. 맞춤식 객실 침대는 호스텔 15년 이상 호스텔을 운영한 지식의 집합체라고 할 수 있습니다. *교토는 2018년 10월 1일부터 새로이 숙박세 적용이 시행될 예정입니다. 숙박료가 JPY20,000(1박/1인당) 이하인 경우 세금 JPY200(1박/1인당)이 부과됩니다. 세금 지불은 숙박시설에서 하시기 바랍니다. 넓은 침대를 갖추고있습니다. 침대의 2층에 머물면 다른 곳과는 다르게 짐을 2층에 보관할 수 있습니다. 1층 침대에 머물면 독립적인 침대에서 지낼 수 있습니다. 침대에는 개인 등, 콘센트 그리고 커튼이 있습니다. 와이파이도 이용할 수 있습니다. 안전한 락커도 도미토리 객실에 있습니다. 체크인 전/체크아웃 후 짐 보관이 가능합니다. 장기 짐 보관의 경우 재숙박할 때만 가능합니다. 우리는 교토와 일본에 대한 다양한 정보가 있습니다. 호스텔은 나라, 오사카, 히메지, 고베 그리고 시가 1일 투어를 하기에 적합한 위치입니다. 교토역에서 내려서 걸어가기에 적당하고, 길 도중 선술집도 보여 구경하기에 괜찮습니다. 스태프도 친절하고 늦게 들어가도 3층에 자는방 없는 샤워실과 조리실이 있어 밤에도 편히 씻고 먹을수 있었네요 게스트하우스 내에서 1일버스프리티켓도 살수 있으니 일거양득 또한 교토역까지 안가도 버스정류장이 가까워 덕분에 여행이 편했네요 청결유지도 좋구요 ㅎㅎ이 가격에 머문다면 이득입니다 정말 ㅋㅋ 다음에 오더라도 이곳에 머물고 싶습니다. 교토역에서 10분 정도? 걸어야하지만 한적하고 조용한 길이라 구경하면서 걷기 좋았어요. 스탭분들 친절하고 숙소에서 원데이버스패스 구매 가능하니 필요하신 분들은 사두면 좋아요. 근처에 버스 정류장이 여러곳 있어서 생각보다 잘 썼습니다. 엘레베이터가 없어서 4층까지 캐리어 들고 올라갔다 내려가야하는 불편함이 있습니다. 내려갈 때 넘어질뻔해서 아찔했어요ㅠㅠ 잠 잘 수 있는 침대와 공간은 다른 곳에 비해 넓은 편이고 6명만 머물러서 조용했습니다. 샤워기 수압도 쎈 편이라 좋아요. 편의점은 근처에 로손이나 세븐일레븐이 있습니다. 교토역 근처 아반티 돈키호테에서 쇼핑하고 돌아오기도 좋아여! 다좋습니다. 다만 아쉬운점이 하나 있다면 캐리어를 들고 올라갈때 계단이 매우좁아 힘들수 있습니다. 그리고주변술집중에 바로옆에있는 술집있는데 거긴 조심하세요 바가지를 당할수도 있습니다. It was so awesome to stay in J hopper!! Staff are extremely kind and always ready to help! Specially Emiko...she is amazing!! I was worried to stay in mixed dorm but all the beds are separated by curtains!! I highly recommend to stay there!! I think what guests like most about our property is our very friendly, English-speaking staff. We just love chatting with our guests! Toji Temple is just 15 minutes' walk from our hostel and has the highest wooden pagoda in Japan. I personally recommend visiting the Fushimi Inari Shrine. It's an important Shinto shrine in Kyoto and has trails leading into the wooded forest of sacred Mount Inari, which stands at 233 meters and belongs to the shrine grounds. At the back of the shrine's main grounds is the entrance to the torii gate covered hiking trail, which starts with two dense, parallel rows of gates called Senbon Torii ("thousands of torii gates"). The torii gates along the entire trail are donations by individuals and companies.